← Chris Hemsworth in a Wetsuit – Phwoar! Whether you are already pregnant, or you are thinking of starting a family and are wondering whether or not that scuba diving trip next year is such a good idea, it’s incredibly important to understand the medical implications of scuba diving whilst pregnant. For those of you who have plenty of dive experience, we know it’s a difficult thing to have to forego, so read on to find out if it will still be safe for you to take the plunge while pregnant. The first area of concern for anyone contemplating diving with an unborn infant is the idea that decompression illness could harm your unborn baby. When children are in the womb, their blood circulation doesn’t encounter the lungs, which means that if inert gas bubbles have formed in the body during a dive, they won’t be filtered out as with normal circumstances. 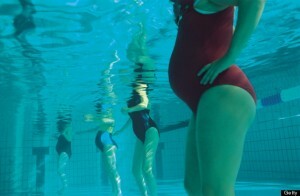 It is also the case that the changes in the body of a pregnant woman can have an effect on their health during a dive. The increase of deposited fat in the body through pregnancy along with swollen hands and feet can also mean the body struggles further with the taking in and releasing of inert gas. On the basis of the points above, it’s safe to assume that there should be an increased risk of DCI for any pregnant woman who chooses to scuba dive. However, this prognosis is only put forward on assumptions. There are serious and obvious problems in terms of being able to properly study the potential risks for female scuba divers when pregnant. The only way to gain a true understanding of the risks would be to monitor women who are pregnant diving, which would obviously represent a serious danger to the lives of both the diver and the unborn child. This really leaves scientists at a point where theoretical evaluation is the only way we can approach the situation. The last tests published on the subject were all the way back in 1989, and most studies have been carried out in the past on animals, or on anecdotal evidence regarding women who have dived without being aware that they were pregnant. Of course, little of this research can be relied upon for a variety of reasons, none less so than the fact that all data is at least twenty five years old. Despite the difficulty we have with any reliance on previous studies, it is worth noting that a very high proportion of women who have been recorded diving at all depths during pregnancy have experienced no adverse effects either in their own health conditions or that of their unborn babies. We think that it’s safe to say that scuba diving for women who are pregnant should be avoided at all costs. Yes, there is some evidence to suggest that you may well not suffer if you choose to take the risk, but a risk is exactly what it would be. Scuba diving is a truly unique experience and if you love the sport it’s going to be hard to leave it alone for nine months, but leave it alone you must! Stay safe, buy a snorkel and stay in the shallows! This entry was posted in Health, Scuba Diving, Water Sports and tagged Baby, Health, Pregnant, Scuba Diving. Bookmark the permalink.